For 2014, Toyota’s Highlander has been updated for the first time since 2008, and is now in its third generation iteration. It is a car-based mid-sized SUV with seven-passenger, three row seating. 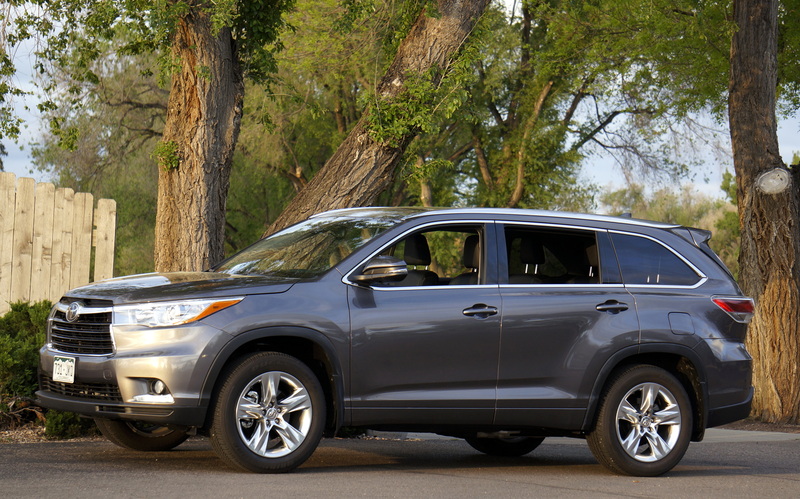 Sales of the Highlander (127,572 in 2013) places its revenue right in the middle of the Toyota SUV lineup. This past week I was able to test a Highlander, a Limited top-of-the-line unit that carried an M.S.R.P. of $44,675.00, including freight. The Limited’s base price of $43,590.00 had as an option a set of carpeted floor and cargo mats ($225.00). It was what was called the Platinum Package edition, and that meant inclusion of a technology package, a panoramic moonroof, heated steering wheel, and heated perforated leather second-row captain’s chairs. The extra technology equipment included radar adaptive cruise control, lane departure alert, automatic high beam headlamps, and pre-collision warning. Limited model items on my test car included power liftgate with glass hatch, 19” five-spoke alloy wheels, anodized roof rails, three zone climate control, JBL/Entune navigation with 8” screen, perforated black leather seats, pushbutton starter, proximity keyless entry, tilt/telescope, heated and air conditioned front bucket seats, backup camera, and nice Optitron instrumentation. Styling, with the 2014 revision, was great. So was the opulent-looking gray paint, “Limited” badging, and polished Chromtec finish on the wheels. The tires mounted on the alloys were 245/55R19 Bridgestone Dueler H/L 422 mud and snow radials. Power for the Highlander is supplied by a 3.5 liter V-6 with 270 horsepower and 248 lb. ft. of torque. The transmission is a six-speed automatic with snow mode and full-time four-wheel drive. A unitized body is employed and four-wheel independent suspension and disc brakes are, as well. EPA fuel economy ratings are 18-city and 24-highway, with a combined rating of 20. For the week that I drove the Toyota, my observation was of 23.5 mpg. Weight is 4,508 lbs., towing capacity is 6,000 lbs. and the fuel tank holds 19.2 gallons. Overall length is 191.1”, 3” longer than a 2013, and cargo volume behind the third-row seat is 13.8 cubic feet, another improvement over the 2013 Highlander. I enjoyed the styling, interior comfort, visibility, road noise (or lack of), and guidance of the Highlander. The ride was satisfactory, and I feel that this year’s Highlander makes a nice family hauler and/or travel vehicle. 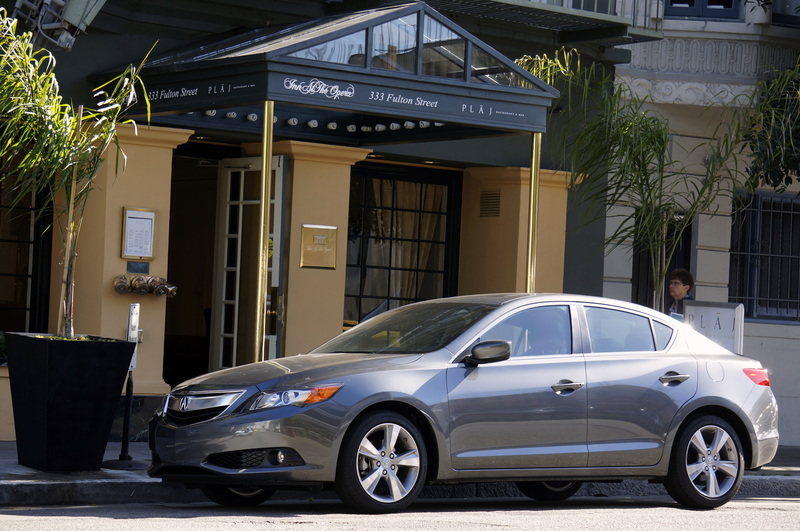 The Acura ILX is the entry-level luxury car sold by the upscale division of Honda Motor Company. It is based on Honda’s Civic, with luxury appointments to bring it up to the Acura standard. It is the first luxury compact sedan sold by Acura in America since 2001 – that was the Integra. A month ago I travelled to San Francisco to test an ILX, with plans to both attend some Giant-Rockie games and also to drive it to Salinas, California. Ruth, my wife, accompanied me there and our stay was at the Inn at the Opera on Fulton Street near Haight-Ashbury. I mention that district because as a child of the 60’s, I served in Viet Nam, had a stay-at-home Mom, fell in love with cars, enjoyed reading John Steinbeck’s books, and watched scenes from Haight-Ashbury on television. The hotel was also relatively close to Golden Gate Park, the Civic Center, AT&T Park, and Fisherman’s Wharf. San Francisco is quite compact. As a little boy, I read those books written by Steinbeck, the Nobel- and Pulitzer- prize winner from Salinas, and I often fantasized about that area of California. So Ruth and I drove there, about 100 miles away, in the ILX. In Salinas is the National Steinbeck Center, the only museum in America dedicated to one author. Between it, lunch, and driving the Acura down U.S. 101, it was a very pleasurable day. The test Acura was the 5-speed automatic with technology package, priced at $31,600.00 (base). Freight, added to the M.S.R.P., brought the total to $32,495.00. The 5-speed automatic had sequential sport-shift setup with paddle shifters on the steering column, and the engine was a 4-cylinder, 2.0 liter, 150 horsepower unit with EPA ratings of 35 mpg on the highway, 24 in the city, and a combined rating of 28 mpg. 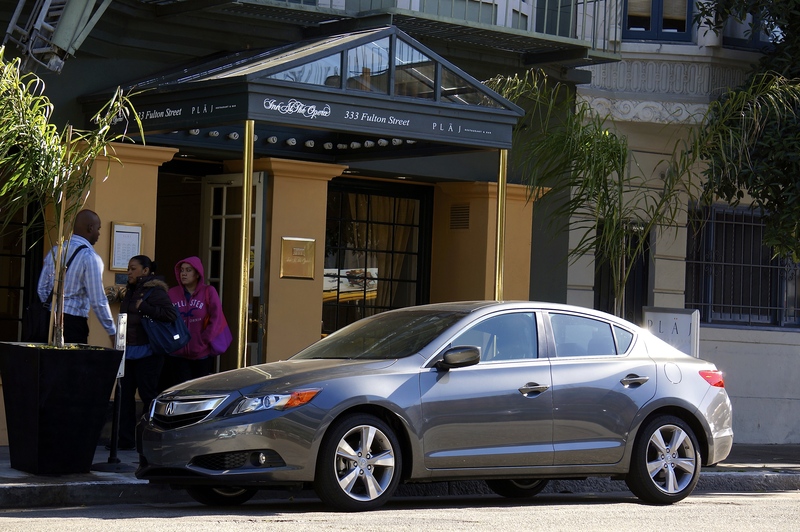 Premium gasoline is required in the ILX, and the tank holds 13.2 gallons. My observation of the gas mileage for the ILX was 27 mpg. Handling, guidance, and ride of the ILX were all suitable for the five-passenger sedan. The road noise on our highway cruising was about average for a sedan of this size and caliber. Acceleration to 60 mph reportedly occurs in ten seconds and top speed is 113 mph. The fifteen foot car sits on a wheelbase of 105.1” and weighs 3,000 lb. The interior was leather-equipped, came in black, and featured the navigation (8” display), cruise control, backup camera, power locks/mirrors/doors, seven-speaker premium stereo with satellite radio, pushbutton start, and proximity keyless entry. Ruth and I found the front buckets to be supportive and attractive and back seat legroom for our daughter was adequate. We were able to just get by, luggage-wise, with the 12.3 cubic foot trunk. Acura manages to make the ILX look more expensive and attractive than its sister, the Honda Civic, and the five-spoke, 17” alloy wheels added to the allure. Shoppers in this category would do themselves a favor by taking a long look at the ILX from Acura.